These Terms and Conditions (T&Cs) govern your use of the FairPrice Lucky Draw Portal (https://luckydraw.fairprice.com.sg/) and your relationship with FairPrice ("we", "us", "our", the "Website", "FairPrice"). It is important that you go through the policies and understand them before registration. This set of T&Cs will help you understand how FairPrice Lucky Draw Portal operates and ensures that we serve you fairly and properly. Only registered users are able to login through FairPrice Lucky Draw Portal. These T&Cs apply to any registration and login performed on FairPrice Lucky Draw Portal. FairPrice Lucky Draw Portal is open to all except FairPrice employees and their immediate families, advertising agencies and printers. FairPrice Lucky Draw Portal reserves the right to amend/update this set of T&Cs at its sole discretion without notice to the user. Registration provides a unique identification for each user, and helps us trace all lucky draw transactions in cases where there are queries or problems. Registration is simple and done only by an individual user. The user must provide his/her NRIC/FIN number, mobile number and/or email address. The NRIC/FIN number, mobile number and/or email address will be required for login to FairPrice Lucky Draw Portal and upon such login, a unique One-Time Password (OTP) will be generated. Mailing address will also be required for the purpose of winner's notification. Users must ensure that all details provided during registration are correct, up-to-date and complete. Any changes to details provided during registration must be updated by informing FairPrice or via its website. Users will be asked to provide their NRIC/FIN number upon registration. Your NRIC/FIN number and unique OTP must be kept confidential and must not be disclosed to or shared with anyone. You will be responsible for any activities that are submitted under your NRIC/FIN number. FairPrice Lucky Draw Portal reserves the right to refuse, suspend or terminate registration of any user immediately at our discretion. All winners will be notified by post. Each participant is eligible to win only one prize in the draw. Prizes are not exchangeable for cash and non-transferable. The results of the lucky draw are final and no correspondence will be entertained. NTUC Fairprice Co-operative Limited reserves the right to change any terms of the promotion without prior notice and to substitute any prize with one of similar value. Unclaimed prizes will be donated to a charitable organisation. h. for such other purposes as permitted by applicable law or with your consent. 2. In compliance with the PDPA, FairPrice will not send marketing messages to Singapore telephone or facsimile numbers belonging to you unless you have given us clear and unambiguous consent to do so. If you have previously given us consent, we will continue to send you marketing messages until such time when you advise us in writing that you wish to withdraw the consent. 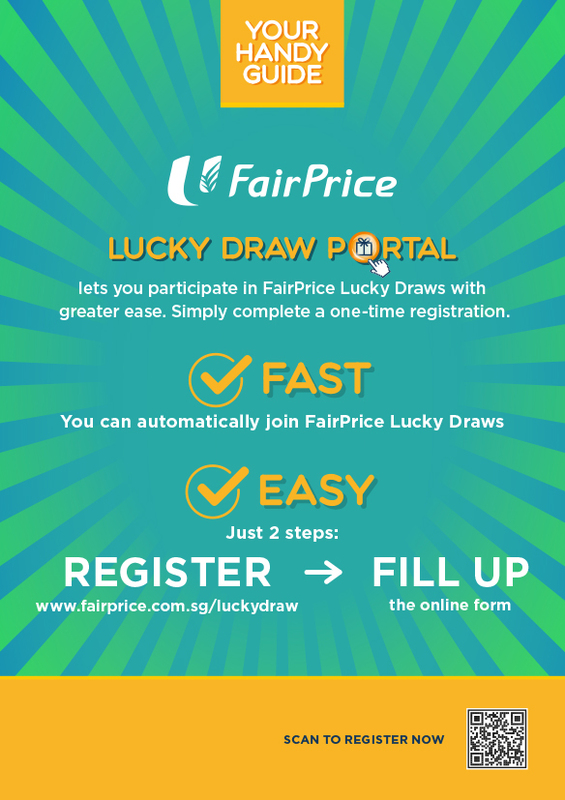 You acknowledge that the FairPrice Lucky Draw Portal website contains information, data, software, photographs, graphics, typefaces, music, sounds and other material (collectively "content") that are protected by copyrights, trademarks, database and other intellectual property rights owned by us or our vendors. You may not modify, reproduce, copy or distribute any of the content on FairPrice Lucky Draw Portal for commercial purposes without our prior written consent. 6. Making, transmitting or storing electronic copies of materials protected by copyright without the permission of FairPrice. Whilst all attempts will be made to ensure FairPrice Lucky Draw Portal website access is available all the time, access to the Site may on occasion be interrupted by on-going updates, repairs, maintenance or the introduction of new services. These T&Cs shall be governed by and interpreted in accordance with the laws of Singapore. Both the User and FairPrice irrevocably and unconditionally submit to the exclusive jurisdiction of the courts of Singapore. If you violate any of these T&Cs, your permission to use the Website may be suspended or revoked, and we reserve the right to suspend or terminate your access to, and use of, the Website at any time. By registering yourself in the Lucky Draw Portal, you will automatically be eligible to participate in all future electronic lucky draws. You will no longer need to fill in your details on physical stubs. You only need to register once. 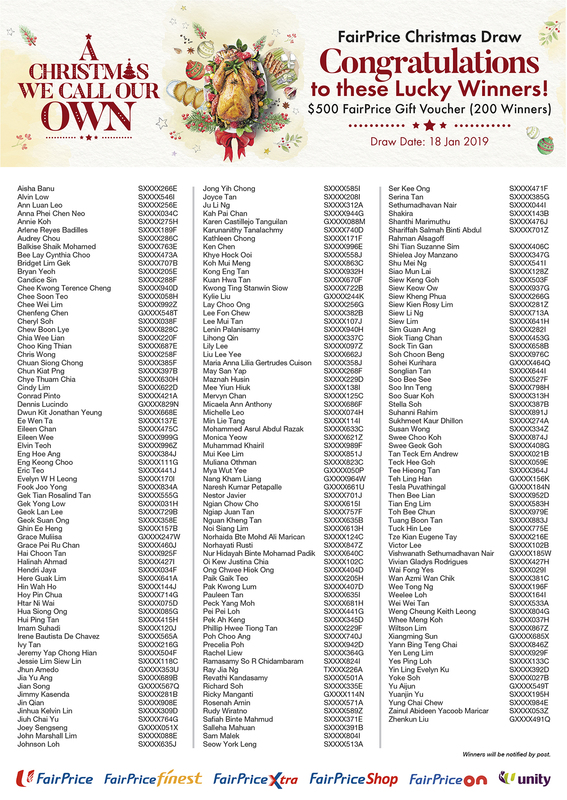 This free and simple registration ensures that you are enrolled in the lucky draw for every eligible purchase. You will also be able to view your lucky draw chances at a glance. I do not know how to register. I do not have internet access. What can I do? Please approach our service staff for assistance on using the in-store kiosks. What information is required for registration? How do I know if my one-time registration is successful? Why password/ PIN was not generated during registration? There will be no password/PIN generated during registration. Each time you login, a One-time password (OTP) will be sent to you. This will be used for login. If I need to change any of my particulars such as address, how can I make the changes? Please login to edit and confirm the changes. If I have registered using the wrong mobile number, how can I make the change? Please call 6552 2722 for assistance. Do I have to pay any registration fees? When will my membership expire? Your one-time registration will be valid for a lifetime. Is this a FairPrice membership? No, this is an electronic portal that allows you to participate in FairPrice lucky draws. Can I combine my account with another user? No, each account is unique to an NRIC/FIN number. Can I accumulate my chances from another account? No, each account is unique to an NRIC/FIN number. You may only accumulate chances on your own account. How long will my chances be valid for? All eligible chances are valid for the specific campaign period only. Can I convert the chances to rebates? No, chances cannot be converted, transferred or exchanged in any way. Do I need to create a password for my account? No, a one-time password will be generated and sent to your registered mobile number or e-mail address each time you sign in. How do I check my lucky draw chances? Will my lucky draw chances be reflected in real-time? Chances will be reflected in your account one working day after your purchase. I no longer want to participate in electronic lucky draw (ELD). How do I delete my account? Please sign in and select "no" under "Enrolled for lucky draw". Your ELD account will be deleted. Is there a minimum age requirement to register in the Lucky Draw Portal? What will you do with my data/information? It will be kept strictly private and confidential, and used solely for the purpose of lucky draws and any other purposes which you have consented to. Will you send me promotional materials and/or marketing messages via e-mail or SMS? We will only do so if you have indicated your consent during registration. Is this electronic lucky draw (ELD) a scam? No. FairPrice has indeed migrated from paper to electronic lucky draws. Do ensure that you access our website by typing the full web address instead of using a link from unknown source. On the top of our home page, you can click on the icon "lucky draw portal" to register. What is the difference between the old lucky draw process and the new Lucky Draw Portal? You will have to fill up an entry stub for each lucky draw in the old process. With the new Lucky Draw Portal, you only need to register once to take part in all future lucky draws.After successful registration, you will only be required to present your NRIC upon check-out to take part in a lucky draw. What do I need to do to qualify for each electronic lucky draw? If you qualify for the lucky draw, cashier will prompt you for an appropriate linkcard (for member) or NRIC (for non-member). No action is required from you as the lucky draw chances will be added and it will show on your receipt as well. How often are lucky draws conducted? Lucky draws take place throughout the year. Please refer to in-store publicity materials for details of any lucky draw promotions. How are lucky draws conducted? Winners are selected via a computerised draw using our custom-built software. This is conducted in a publicly accessible location, such as the FairPrice Hub Lobby. How will I be informed if I am a winner? You will be notified via mail or e-mail. Winner details will also be published on in-store posters and FairPrice Online at www.fairprice.com.sg. 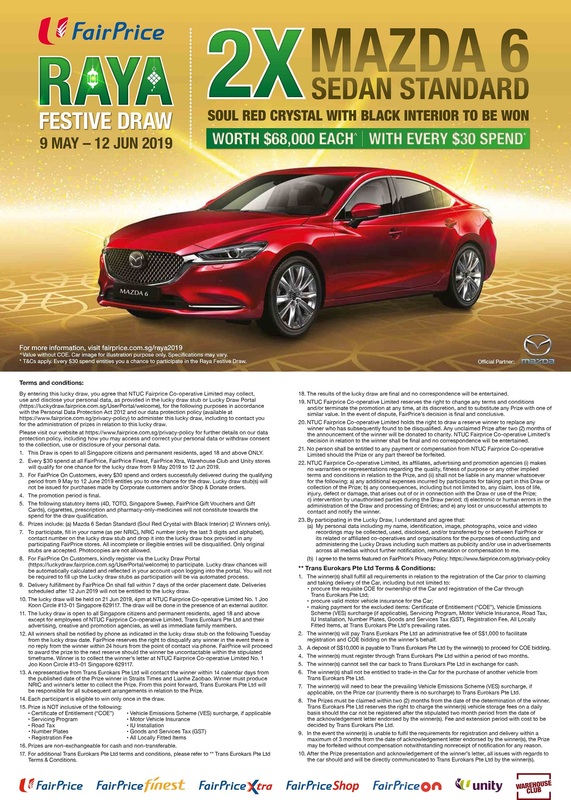 To qualify for the electronic lucky draw, is manual key in of NRIC allowed at cashier? Can I scan my Driving License instead of my NRIC/FIN? No. Only NRIC/FIN number is accepted. Will my physical receipt show the total number of chances accumulated? No. The physical receipt will reflect the chances for that particular purchase only. These Terms and Conditions (T&Cs) govern your use of the FairPrice Lucky Draw Portal (www.fairprice.com.sg/luckydraw/) and your relationship with FairPrice ("we", "us", "our", the "Website", "FairPrice"). It is important that you go through the policies and understand them before registration. Users must be over 18 years of age at the time of registration to qualify and must ensure that all details provided during registration are correct, up-to-date and complete. Any changes to details provided during registration must be updated by informing FairPrice or via its website.